I've posted a couple of other times here, and have gotten GREAT assistance! Thank-you dedicated Joomla Stack Exchange helpers! I have a 22-piece big band swing/jazz group called William and the Romantics. When we play a gig, my band director sends us a set list (see image below) that he created using some sort of office automation tool. I would like to automate this for my band director so he can jump on our personnel site (which is up and running thanks to your help!) and just fill out the information for upcoming gigs. I think I need an intelligent form tool for this. I am very happy with the extensions that you have recommended so far. Maybe there is an extension that will work? Read on. (2) Each song has a duration. My band director is an ACE at setting up set list durations that come in right on time so that we get even breaks. The "Mercury Cafe" location that we play at has two sets with one 15-minute break in the middle. Downbeat is a 8, we play till 10:30, so band director needs to fill 2 hours 15 minutes with song durations. (3) There is a list of alternate songs. This is hugely helpful in the event a singer has an emergency and has to take the night off (which has happened before). So...the set list form needs to have some intelligence to it. Only the site admin (me) and the band director need to have access to it. It's not an end-user thing, it's an intelligent form thing that goes into action when we need a set list. I kind of imagine it pulling the songs' durations from a lookup table of some kind, and adding up the total in a column so the band director knows how long a particular set goes. I have no compunction about creating this table (which would probably be song name, singer and song duration). Hopefully the extension would provide this methodology, or at least some help in figuring out how to create it. Additionally, the color coding of the singers is important. A singer that cannot make a gig has their name printed on the set list in strike-through. Maybe a checkbox the band director could click so we know that singer's not going to be there? Maybe tie each singer to their song so the band director does not mistakenly include them on the set list? Rather than having a long list of checkboxes (our current repertoire is around 150 songs), it'd be nice for the band director to be able to select a song off of a drop-down and place it in the next row down in the current set he is working on. ForScore works this way and it is might handy. In ForScore - which is a musician's and singer's tool for including songs in gigs and having the song show up in your iPad, you pick a song off the right-hand list of all songs in your repertoire, and then it copies that song to the set list on the left-hand side. I think it would be hugely helpful if he had a dropdown of subs that were playing the gig. We have a guy who handles most sub bookings, and he and the band director could coordinate this so that the set list could go out to the subs when they needed to play a given gig. I imagine the sub list also being a drop-down, but one that would ultimately populate the email list of folks who'd be getting the set list. Speaking of email list, I would like to have our band director be able to hit a button that sends the completed set list to all musicians (including any designated subs), as well as the singers. I'd like to have a Save button that saves the set list off to a folder on the personnel site with venue name and date and time stamp. When a musician, sub, or singer receives the set list, I would love it if the email (or text) they get has a link on it that just sends them to the personnel site. They can download the set list from there, and print it out. In the event the site is down for whatever reason, maybe including in the email the PDF of the set list would be handy. 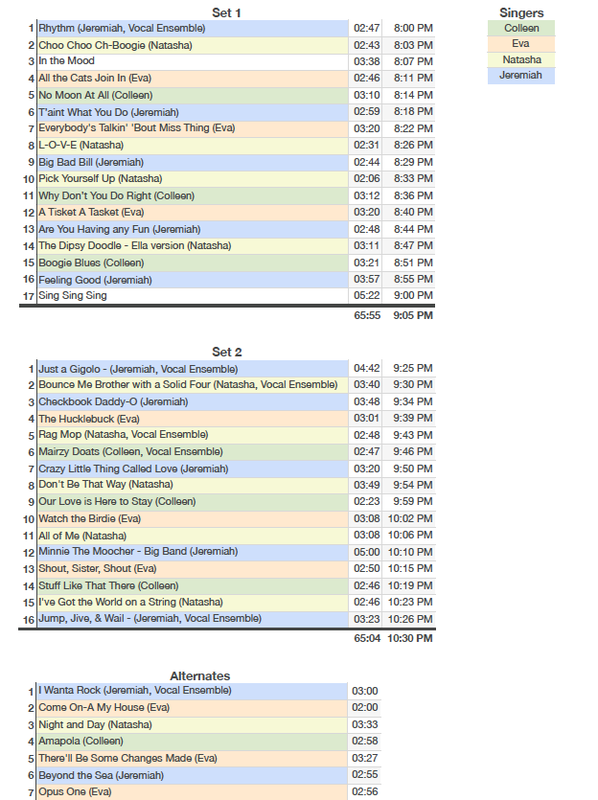 Finally, it would be wonderful if those of us who need to see the set list taped to the floor on the stage (think singers), could print out a larger landscape version that they could easily see from their position at the microphones. Our singers introduce all other singers and songs, so being able to print out a readable (e.g. large font) edition of the set list (color or B&W) that they could tape to the floor would be a huge help. I print out the current PDF version (see image below) for our sound mixing guys, and the ordinary portrait size is fine for them. I am technical enough that I think I could tackle an extension that would do these things for me. I just don't know which extension might fit the bill. I have one that I'm trying to use right now that I paid $30 for a 6-month (!) subscription, and it is not going to meet my needs. Is this a Joomla thing, to have subscriptions expire every half year? I'd rather not have to write code if I can help it. I can write code, but, honestly, if there's an extension that will do what I need, I'm happy to go with that instead. Your scenario is most suited for a custom component. Also, I'm not aware of any particular extension that can do what you need mostly out-of-the-box. That being said, I can see your form being built in RSForm Pro, with some (maybe a lot of) coding labor. With RSForm I was able to make a 80 questions online test, with custom play-once audio questions, and a custom color coded answer sheet for the teacher evaluating the test results. It took me a couple of days, half of it for data input, but it works like a charm. You will need to create the tables for both singers/subs and for songs. That table can be fed from a separate form in RSForm Pro as well, or manually via PHPmyAdmin. The RSForm docs site has a lot of documentation on how to achieve most of the things you need, and you may need to do some research on your own, but everything you need is achievable. Since your gigs have a limited duration (around 2:30hs), you know the maximum number of songs that can fit into this period, so you can add that number of forms (as far as I remember, there is no way to add fields dynamically in RSForm). The color coding will be handled by quite a bit of jQuery. I think most of the coding here is pretty basic. As for output, RSForm can generate two different PDFs, one for the admin, one for the users. You can make the reading size with the user's PDF and the bigger size with the admin's PDF. The PDF output is highly customizable. When you start exploring the possibilities of RSForm, you may even add some extra nice things that were in your wishlist. Not the answer you're looking for? Browse other questions tagged extensions or ask your own question. How to track separate QR codes on the same website?